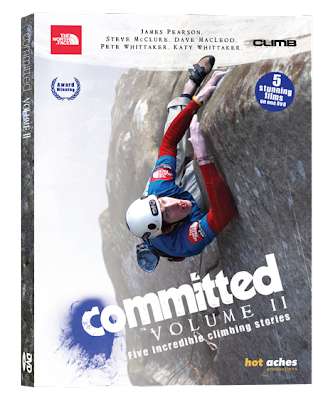 Just in case you thought that we were putting our feet up after finishing Committed 2, we now have another DVD coming out. 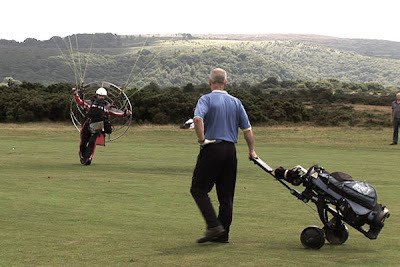 Six men set out on their quest to fly the length of Britain on paramotors. 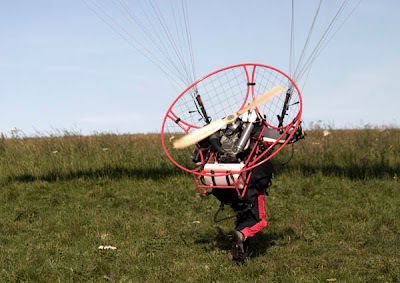 Like the earliest methods of aviation this is flying in it’s most simple form. 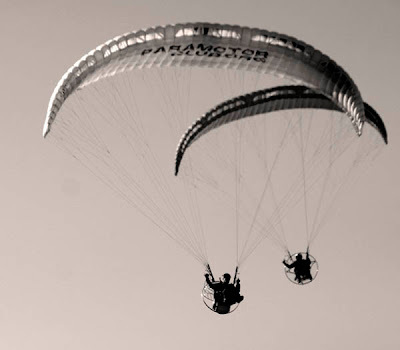 Suspended beneath a fabric wing and with a small propeller on their backs they set off on the journey of a lifetime. The range of flying conditions that Britain throws at them takes a heavy toll and one by one the pilots encounter their own personal disasters. There are mid air wing collapses and free falling through the sky, crashes on take off, wings sucked into the engines and emergency landings abound. This is no easy ride. The tension rises and when the team are forced out of the sky over the Scottish Highlands it looks like the expedition is doomed. But with true British determination they gradually they inch their way ever northwards into the eye of the storm. 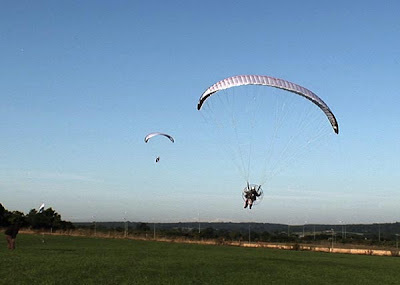 The Tip to Tip expedition was created to raise funds for the Air Ambulances of England and The Forces Children’s Trust. £5.00 from the sale of the DVDs go to these charities. 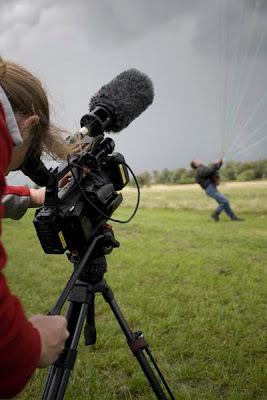 When we went to film the Cornish Air Ambulance I was really surprised to find out that it wasn't publicly funded. It seems ridiculous that such an important emergency service should rely on charity. Each air ambulance and it's crew costs over £1 million a year to run. But I changed my mind on this one. The reality is that if the air ambulances were publicly funded, then they would be the first part of the ambulance service to be cut when funds are tight, so staying independently funded works. The DVD is released on 12th December. 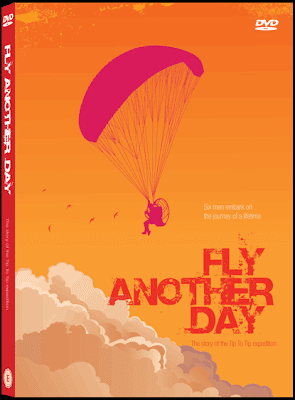 You can pre-order your copy in our webshop now. With all this talk about grades recently... we decided to publish a fascinating interview about what was the very first E9. This footage had been languishing in our archives for a while so it seemed like a good time for an airing. Johnny Dawes and Nick Dixon were two of the most influential climbers of their generation - no less than climbing legends. In this interview they talk about their experiences on Indian Face. It is fascinating stuff. This isn't an interview that will appeal to everyone, but to those climbers who have been kicking around for a while and remember the time when major climbing ascents made the centre pages of The Guardian, or film releases such as 'Hard Grit' prompted TV appearances from the stars doing one-armers on Breakfast TV - well, for this generation at least, this inteview might well raise the hairs on the back of our necks - two climbers talking frankly about their ascents of one of the most significant rock climb in recent history. What is even more significant for me was the fact that this was the first time that these two guys had got back together for over a decade. They had shared so much common ground, experience and history. It is such a shame that so many of us drift apart and go our seperate ways. One important hint - watch the last 60 seconds! VAT is down to 15% today, so of course we are passing on that price reduction to our customers.That means that in our webshop Committed Volume II (and our previous DVDs) are all reduced to the nice round figure of £19.56 (£18.58 for E11). 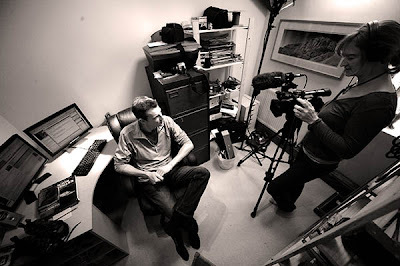 On another more interesting subject, we are finalising another DVD right now. Should have a trailer up for it over the next two days. More on that soon. 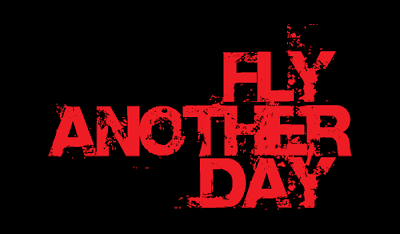 It is one of those great days. After a year's worth of filming and editing, the DVDs finally arrived back from the manufacturer. 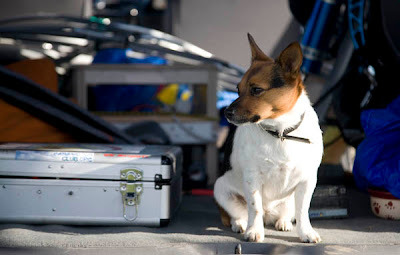 After a nervous check to make sure that everything is right, and it all plays properly (film makers get paranoid! ), and now we can get down to the business of getting stock out to our customers and to retailers. 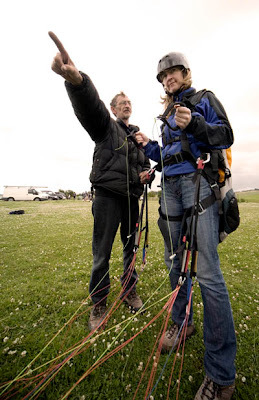 We are heading down to Kendal for the weekend's mountain festivities. We have no less than 5 films screening there, three of which have never been seen by the public before. So that is quite exciting. 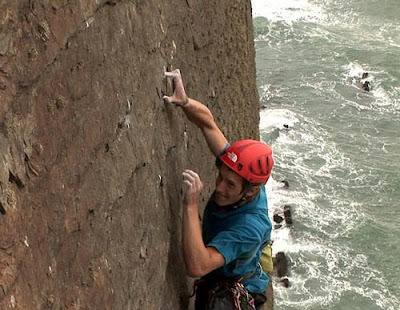 On Friday evening we have a special screening / lecture session with James Pearson talking about his climbing and a screening of our two new films about his routes. 6.00pm in the Town Hall. It is a bit early in the weekend for everyone to make it to, but it should be a good session. Elsewhere at Kendal, 4 of the films are getting multiple screenings, so if you are at Kendal then there's no excuse to miss seeing them on the big screen. We are making the long journey home to the UK from Banff, Canada. Whoever booked the flights clearly didn't take time to look at a globe, for I am currently sitting in an airport at Houston, Texas, feeling rather tired. And Hot Aches won 3 Awards, yes 3 ?!? Banff Mountian Film Festival is probably the most presigious of all festivals to win awards at, so we were pretty happy chaps, as you might well imagine. It is only 10 days now until Committed 2 will be out. A reminder of course that you can pre-order your copy at the link on the right. Committed Volume 2 is finished at last, and will be released on November 22nd 2008. We are now taking pre-orders for the DVD on our webshop. It is going to be a rush getting all shops supplied, so guarantee your copy by pre-ordering now. We aim to be posting out on 21st November. Thanks to the huge number of people who have helped out on this year's film. There is a listing and film credits here. A particular thanks to our title sponsor, THE NORTH FACE, and supporting sponsor CLIMB MAGAZINE whose input has helped make this a DVD that we are really proud of. For more about the film see our films page. Tomorrow we are heading to Canada, to Banff Mountain Film Festival, where three of our films are finalists this year. As you might imagine, we are looking forward to a well-earned break! We were really pleased tonight to pick up an award for our new DVD - which isn't even out yet, another 4 weeks to wait I'm afraid, but for very good reason, I assure you. 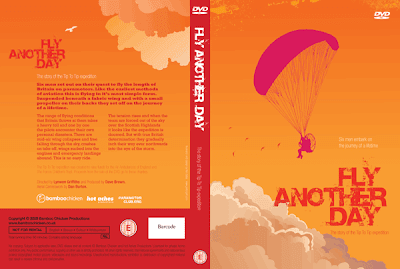 The new DVD contains 5 separate films, and most of these will be premiering at Banff and Kendal film festivals soon. 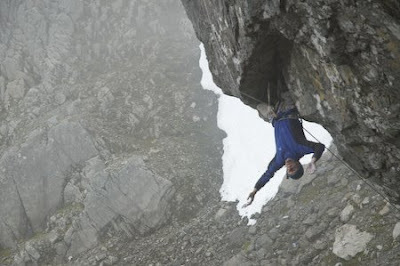 however we decided to show one of the films at Edinburgh Mountain Film Festival. It was one of our favorites from the DVD, in fact. 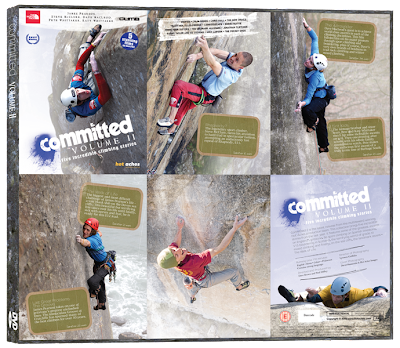 Grit Kids features the audacious climbing talents of two teenagers from the Peak District. You might remember our blog posts from earlier this year. 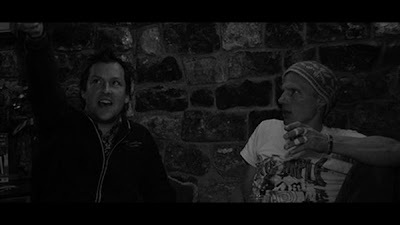 ...and enough people did think "that was amazing" for Grit Kids to pick up the Go Fast People's Choice Award at the Edinburgh Mountain Film Festival. It was cool to watch the reaction to a film that we found quite hard to make. All the other films on the DVD have been quite straightforward. But the Whittakers just kept climbing and climbing. The decision on what story to tell was a tough one. Committed 2 is out in early November. The trailer will be out in a couple of weeks, so we will keep you posted. 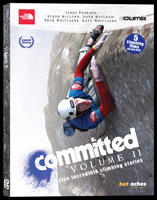 The release of Committed Vol 2 has been put back to early November 2008. The reason? Simply that we were waiting, gambling, hoping that James Pearson would succeed on what has been his hardest climbing project ever. A line that for James, both inspired and challenged him at a whole new level. 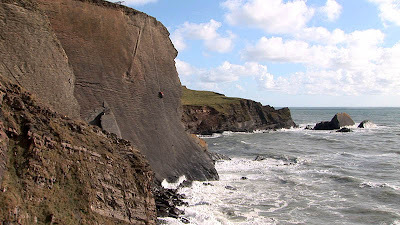 Yesterday we made our 7th filming trip down to the north Devon sea cliffs at Hartland Point. 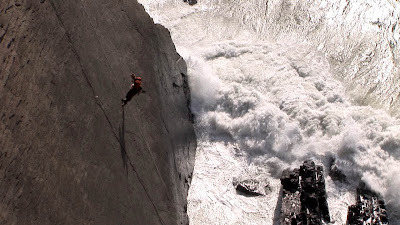 James' project climbs directly up an immaculate expanse of rock, a 48 metre cliff. This section of rock does have some history. Many climbers had attempted the top half over the years, each adding to the ladder of pegs that protected it. The super talented climber Ian Vickers then succeeded in climbing a line in what sounds like 'sports style', with pre-placed quickdraws in the pegs, but that line, Dyer Straits comes in from the easier arete at half height before traversing out onto the face. This was graded E8. 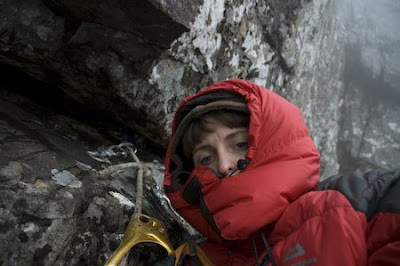 James chose to remove the rotting pegs and climb the route on trad gear. 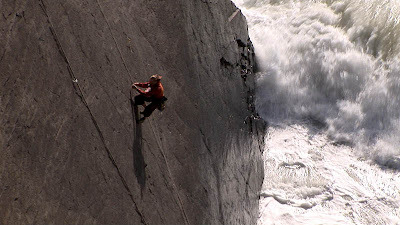 He also chose to climb the face direct from the bottom, somehow finding a path through the expanse of nothingness on the bottom 12 metres. The other climbers that have passed by during our time at the crag all shared a feeling of awe about this piece of rock. It is huge, intimidating and very very blank. But only James can have an appreciation of the true level of difficulty involved. Comparisons have been made with Indian Face on Cloggy. For both these, the psychological challenge is perhaps the biggest factor for the climber. This is not like a gritstone route where a climber can get into the 'zone' and it is all over before they realise. 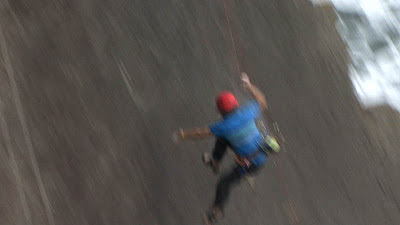 Here the climber is on the route for 45 minutes (Indian Face was about 23 minutes for the 3 ascentionists). That period of time allows the doubts to kick in. "What am I doing here? This is crazy". That period of time also has a big impact on the cumulative difficulty of the moves, compared to just doing them in isolation. So it is not just a head game. It is scary, yes, but hard and also incredibly sustained. James will describe the level of difficulty and his experience on his blog. The grade of E12 is a mighty grade indeed. But James is certainly one of very few to have a track record that enables them to make such an assesment. He also has a responsibility to say honestly what he thinks. As a film maker I cannot comment on the grade, but what I can point out, and what people will see in the film, is that James' experience on this route was far harder and more challenging that anything he has done before, considerably harder - a different level. This includes routes like Equilibrium (the 'benchmark' E10) and his own routes that he felt were harder, then harder again. Some other thoughts about the route. A very quick summary about the route is that is is about 48 metres long. The first 12 metres has some of the hardest climbing and is also unprotected. 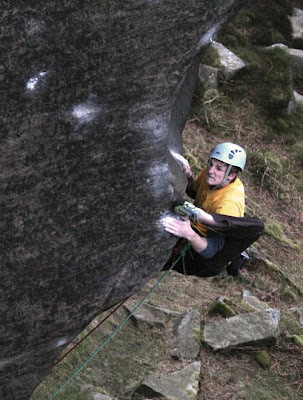 James thinks this would be E10 in it's own right if it were, for example, a gritstone route. The face is concave. The bottom is a steep slab, then it gradually tilts back to vertical. Beyond the first section there is one good piece of gear. 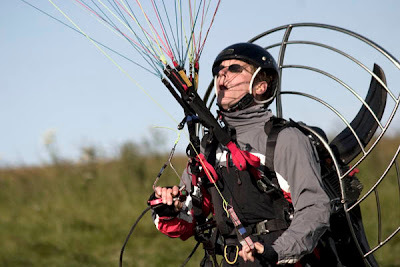 Thereafter the gear is very poor, very difficult to place, and very difficult to tell if it is placed well. Most of the pieces are no 1 or 2 sliders and the seams into which these are placed are either chossy or parallel sided and frictionless. James fell during his first redpoint attempt, a monster fall. I was filming on ab and through the view finder I did not expect him to stop. I was certain he would just keep plummeting. But the gear at that point did hold. I stripped the route for him that day, and the micro cam that held the fall was in a shocking placement, and it was mangled and bent. That day was a quite terrifying experience. We have filmed many routes with James, and he has never fallen before. This time he got away with it. But the consequence of failure meant that he had to eventually return and face that first 12 metres again, and then to hold it together for all that time higher up. So that's it, James, you can relax for a month or two. Do some bouldering. No more scary routes for a while, please. The pictures on this blog are screen grabs, hastily taken from the footage. David Simmonite was taking photos and has some superb pictures. Thanks to all the people who have passed through there while we were filming, and particularly Sam and Rich who were there yesterday. I think this route will become one of those seminal hard routes in the history of our strange sport, the Indian Face of the new generation. 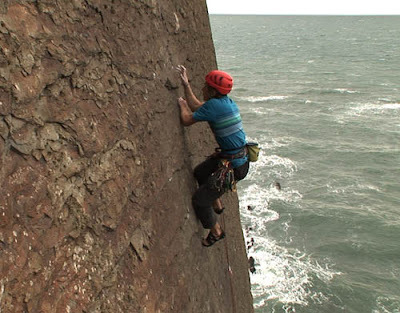 An incredible line on a stunning rock face, and a style of climbing and level of difficulty that demands nothing short of the complete armoury of skills from a top climber; huge technical ability, finger strength, unrelenting footwork, stamina and vast, vast reserves of mental toughness. 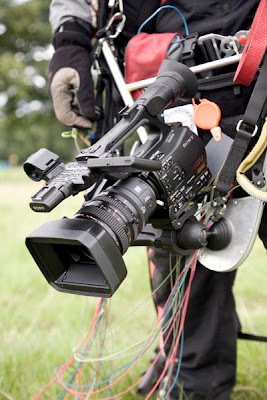 Sony provided us with their new range of cameras for what was to be an extreme road-test on this shoot. 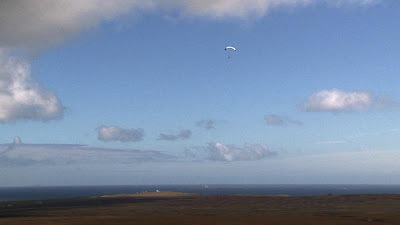 On the 16th day of this '8 day expedition', a solitary pilot gradually inched his way, hugging the ground through buffeting northerly winds, to finally land at John O'Groats - the most northerly tip of Britain. The ordeal had taken a heavy toll. A thousand miles further south at Land's End, six confident pilots set out on this ambitious project, a journey into the unknown. 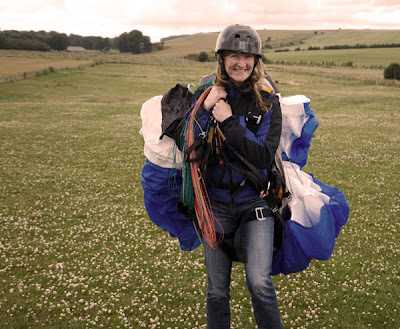 Each one brought to the team a range of different skills and flying experience. But none had experienced the full range of terrain and conditions that the British landscape and climate can throw at you. The next 16 days was a wake-up call. 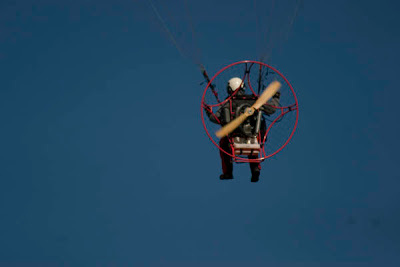 50 miles from the finish and there were two pilots left in the game, plus our arial cameraman, Dan Burton. 30 miles from the finish disaster struck and Simon crashed out using up the third of his 9 lives in as many days. 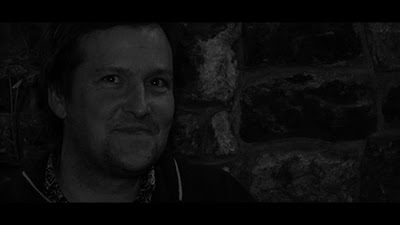 Richard (Whitters), the air ambulance paramedic was the sole survivor, and he continued northwards with Dan. 8 miles from the finish and we were filming Richard from the roof of our camera vehicle. On the telephone to Norman, the logistics guru, and we were as close to slapping each other on the back as it is possible to be over the telephone. Then suddenly Richard was thrown through the air like a rag doll. 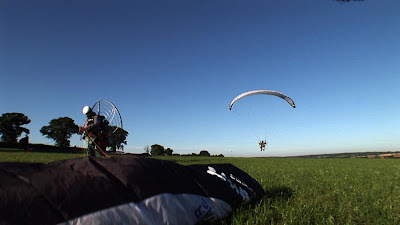 Next moment witnessed an emergency landing in a field. 7 miles to go. Last day of the expedition and the northerly wind had blasted through. The whole team were booked to return south in 4 hours. How can you fly over a thousand miles, and then give up and go home just 7 miles short of your objective? After a two hour wait their was a slight lull in the ferocity of the wind. Still it was the worst take off conditions of the whole expedition. But Richard (Whitters) tentatively embraced a new safety threshold. A fresh intake of pain killers to dumb the pain from an earlier crash. Standing in the field for an age waiting for a slight lull in the elements to give him a chance to take off. And finally Richard was in the air. Going nowhere. 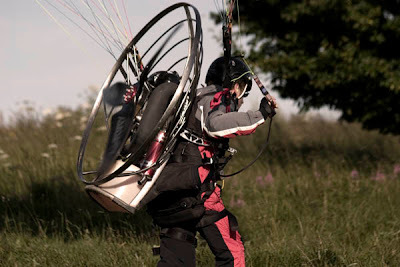 These paramotors fly at about 28 miles per hour. 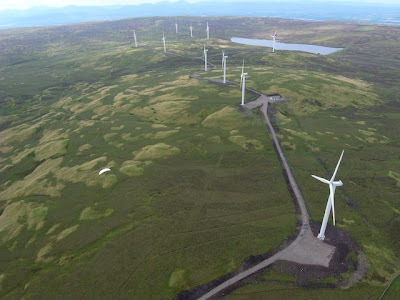 Into a wind of 28 miles per hour you make no ground. Early in the trip with a tail wind they had exceeded 70. But now Whitters was buffeted left toward power cables, then rightwards out to the North Sea. He didn't move forward, but gradually he gained height. Eventually upwards motion changed to forwards motion, and the film crew charged to the top of the last hill to film the arrival. It was an emotional event. 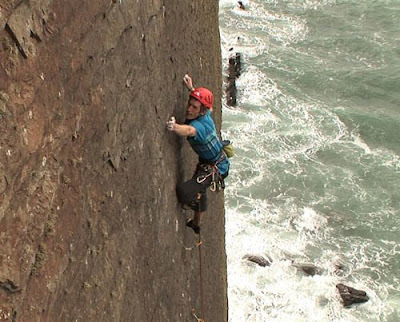 An achievement every bit as impressive as the world class climbing that Hot Aches are more accustomed to filming. So we have a third DVD that will be coming out this Autumn. I hope this will have whetted your appetite. 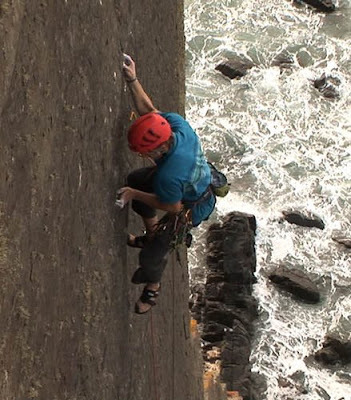 Congratulations to Dave MacLeod who climbed the first ascent of his Echo Wall project this week. 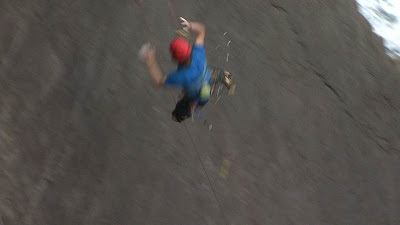 A most remarkable and audacious lead by a climber at the top of his game. 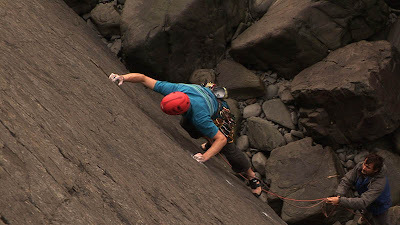 We filmed Dave working Echo Wall a couple of years ago; some of the footage from that went into the 'Future of Hard Trad' chapter in our recent film 'Committed Vol.1'. I have to admit, I personally thought that the ascent of this wall would have been further into the future! It is certainly a futuristic route, a quick examination of Dave's rope strategy is evidence of that. 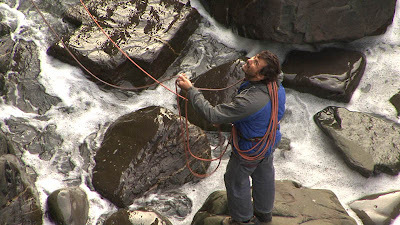 In case you missed this detail, Dave set off with two ropes, half way up he untied and dropped one of the ropes and towards the top he dropped the second rope and soloed to the top. 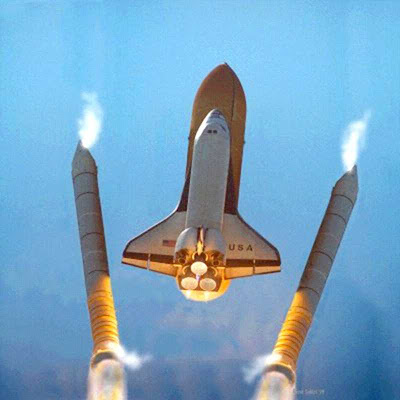 It reminded me of the way the Space Shuttle ditches booster rockets as it travels higher through the atmosphere. I spoke to MacLeod about this and he commented that it felt quite odd topping out on this route with no ropes left on his harness, nothing to untie, no need to shout “take me off” to your belayer. I look forward to watching the film in the autumn. 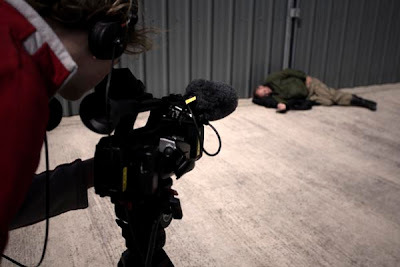 At a secret location deep in the south west of England, our endeavour to bring you dramatic and artistic camera angles didn't go quite according to plan. Here's a sample out-take from one of our forthcoming DVDs.